Makerdemy > Blog > Development board > Scratch 3.0 in BBC Micro:bit : Is it Better than Microsoft’s MakeCode Editor? If you have been following my blogs on BBC Micro:bit, you would probably know the disadvantage of the various platforms of BBC Micro:bit. Feel free to refresh your memory by checking out that blog here. Now let us look at how to setup your BBC Micro:bit for Scratch 3.0. Install Scratch Link on to your computer. If you are on Windows, please click here or if you are on Mac please click here, to download the application. This application basically connects the Scratch online editor to the target device via Bluetooth. Start Scratch Link and make sure it is running. Connect your BBC Micro:bit to your computer. We are going to flash the Scratch Firmware for BBC Micro:bit. Download the hex file from here and copy it to the microbit drive. Now you may remove the USB connection and connect a battery pack. The new firmware will enable wireless programming also OTA programming. This is possible through Bluetooth communication between the BBC Micro:bit and the PC. 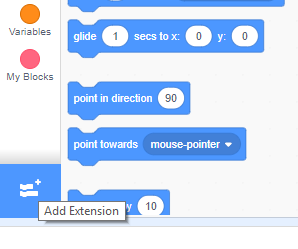 Start the Scratch 3.0 Online editor and add the BBC micro:bit extension by clicking on Add Extensions icon on the bottom left corner as shown here. Now a pop up will show the available BBC Micro:bit’s nearby. Now connect to your BBC Micro:bit and now you can start programming. So, is Scratch 3.0 better than MakeCode Block Editor? When we take a closer look at the blocks provided by Scratch 3.0 for BBC Micro:bit, it is very basic with just a total of 10 blocks. At the time of posting this blog, it does not have magnetometer blocks nor light sensor blocks. It also does not have the level of customization offered by the original platform. The only aspect where Scratch 3.0 shines is the ability to do live OTA programming. My final verdict is that MakeCode editor is better than Scratch 3.0, but if Scratch 3.0 adds new modules regularly it can be a strong contender for Microsoft’s MakeCode Block Editor. I am an electronics engineer by education and passionate about teaching electronics. I am passionate about content writing, video production and teaching a wide variety of cutting edge technologies. I have honed my skills in python, Embedded C and PCB Designing.